For our Python workshops you'll need several pieces of software. To help keep the workshop on schedule, we ask that you install these things before the start of class. First, you'll need to make sure you have Python 3.6 or higher installed on your system. If you already have it, then there should not be any need to re-install it. 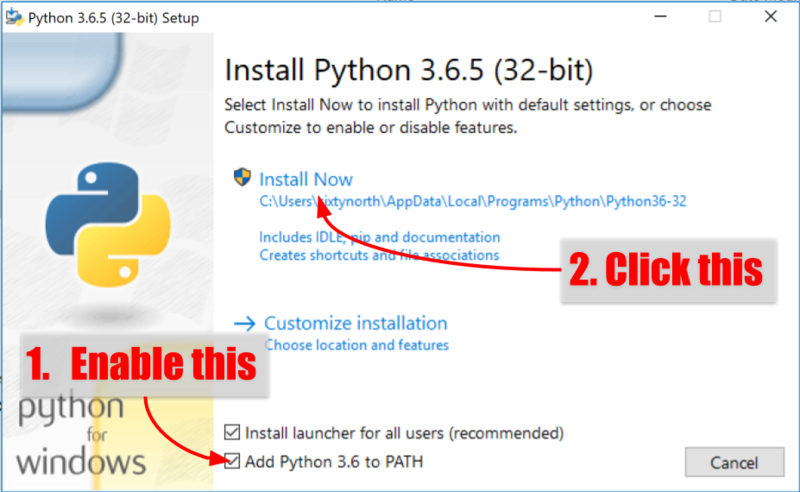 Download the Python installer here. Once you've downloaded it, run the installer. Make sure to select "Add Python 3.6 to PATH". Any version of Python that starts with "3.6" or "3.7" will work. As of now the most recent Python version is 3.7.0, but any version from 3.6.0 onward will suffice. You'll also need an IDE/editor for this workshop. You can use any editor you want, but we generally recommend PyCharm because of its excellent support for Python. Also, if you use PyCharm it's easier for the instructors to support you if there are problems. Download the PyCharm installer here; make sure to select the Community Edition (unless you have a license for the professional version). Once downloaded, run the installer and accept the default installation options.